Adele has cancelled the final two shows of her world tour, due to take place at London's Wembley Stadium this weekend, after damaging her vocal cords. The "devastated" singer said she had taken the decision on medical advice. "To say I'm heartbroken would be a complete understatement," London-born Adele wrote in a Twitter post in the early hours. She had been due to perform at Wembley on Saturday and Sunday, ending a four-date run at the venue. In her post, the 29-year-old said her first two Wembley shows this week had been "the biggest and best shows of my life", but that she had struggled vocally. 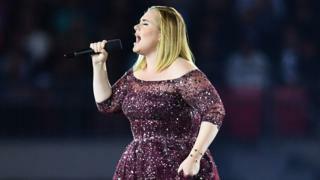 Despite the voice problems, Adele's performances on 28 and 29 June were well-received by critics, with the Guardian describing her as "instinctively charismatic", the Times as "poignant", while the Telegraph wrote: "She is such a natural on stage." Adele explained: "I had to push a lot harder than I normally do... it turns out I have damaged my vocal cords. "On medical advice, I am simply unable to perform over the weekend. "I've considered doing Saturday night's show, but it's highly unlikely I'd even make it through the set and I simply can't crumble in front of you all and walk out on you in that way." She added that she was so desperate to be with her fans that she had even considered miming at the final two shows. "But I've never done it and I cannot in a million years do that to you. It wouldn't be the real me up there," Adele said. "I'm sorry for your disappointment... You know I would not make this decision lightly." She concluded by saying refunds would be available if the shows could not be rescheduled. "There will be more information over the next few days. I'm sorry, I'm devastated... please forgive me x." It is not the first time Adele has experienced problems with her vocal cords. In 2011, she underwent throat surgery to remove a benign polyp. Wednesday's Adele concert at Wembley was attended by 98,000 fans - a stadium record for a UK music event. In a message in the programme, the singer indicated her four Wembley shows could be her last ever tour dates. "I wanted my final shows to be in London because I don't know if I'll ever tour again," she said. "I've done 119 shows and these last four will take me up to 123, it has been hard but an absolute thrill and pleasure to have done." When Adele opened her world tour in Belfast in February last year, it was her first UK concert in four-and-a-half years.